While fans wait patiently for a Smash Bros title to hit the almost year old Nintendo Switch, Angry Mob Games have in the meanwhile created Brawlout, a title that may look the part and possibly get you a bit of a Smash Bros fix, but it sadly falls short of replicating what truly made the Smash series shine. Brawlout is very much inspired by the Nintendo fighter, but its heavy focus on grind-based unlocks and lack of in-depth features make it a title that is hard to recommend, despite the short bursts of fun you can have with it. Brawlout's character select screen is less populated than one would think, even despite the budget price of around $20. Where Smash Bros and other typical fighting games tend to offer dozens upon dozens of characters, Brawlout has a total of 18 selectable fighters, with many of them slight variations on the already small roster, making the cast of characters actually closer to a dozen unique fighters, two of which are guest characters from other games. Juan from Guacamelee makes an appearance here as does the Drifter from one of my favorite games of all time, Hyper Light Drifter, and the whole reason I purchased the title in the first place. While both characters fit well here, the Drifter is extremely overpowered when compared to the rest of the cast. The stages themselves lack any sort of smart design and tend to remind me of the very early Smash levels before the series really started to implement some of its best. Most levels here are just a few platforms that don't offer much in the way of dynamically changing one match in one stage to the other. The desert level does have a glimmer of hope with some destructible pillars, but it still doesn't make the stage anything more than a flat surface and a few platforms. Had the game played around with more verticality, then this part of the review may have gone a completely different way. The game features regular attacks and special attacks, and pressing both together with different directions on the analog stick will change your attacks further, as will running and jumping. Certain attacks can be charged up to unleash a bit more damage, and damage is the name of the game. Even more like Smash Bros, each fighter has a percentage gauge that fills up each time they are hit and a solid attack can cause them to fly off the map. Unlike Smash Bros, you have fewer tools to rely on as there isn't any way to grab your opponent or shield yourself from incoming blows. The game does feature a dodge mechanic, but the lack of shielding attacks or grabbing your opponents makes the combat far too simplified and prevents a lot of traditional fighting game tactics from being a factor here. Instead of focusing on defense and counter attacks, the game promotes a more aggressive pace and far less of one of strategy. For a game that is trying to ape Smash Bros so intently, it's odd that they removed some core mechanics that players would expect from a Smash-like game. Taking another page from Smash Bros, Brawlout features a Rage system that increases your damage output. Each character has a meter near their damage gauge that indicates when Rage is available to be triggered. This meter can enhance special attacks, pull off a combo breaker called a burst, or just simply make the character more powerful for a limited time. Characters will see certain attacks behave differently when used with or without Rage, so learning the in's and out's of how each character acts via the meter does add a bit of depth to each fighter. While the game does offer 18 fighters to choose from, nearly a third of them are needing to be unlocked, and this is the case with nearly the entire selection of stages as well. 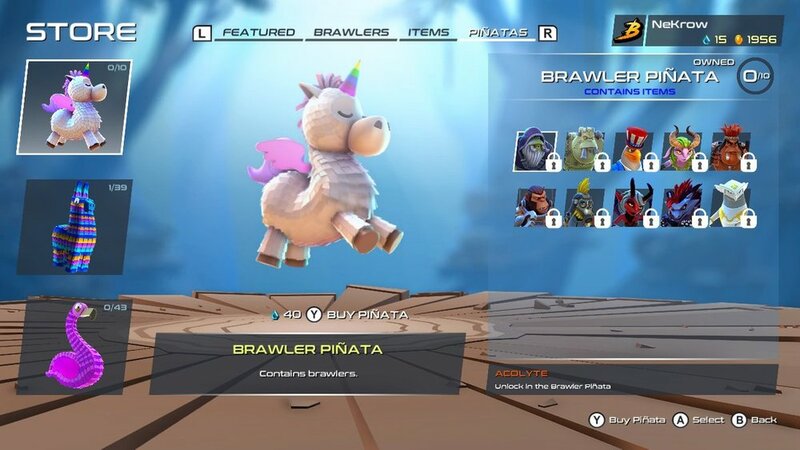 Fighters require an in-game currency used to purchase Loot Pinata's, and the grind to earn enough for the whole cast is unbearable. Stages are unlocked when certain fighters hit rank 8, and that can require a lot of time spent on a character you may not even enjoy playing. Currently, there is a way to back out of the game during the rewards screen on the Switch that allows you to clone all incoming rewards, thus allowing the ability to unlock the entire cast in less than 10 minutes. While this doesn't work to unlock stages, it sure did cut down on the repetitive nature of the grind and allowed me to enjoy some characters that I would never have had the patience to unlock. While there is an online mode for some competitive play, the mode features some painful lag and didn't feel as fluid as playing offline with up to three other players. The lack of a solid online infrastructure doesn't look to help this game garner any sort of future in the competitive fighting ring. It may sound like I am layering my critique in the fact that Brawlout isn't Smash Bros, and that is a fair account of what I've written into my review. However, keep in mind that Brawlout doesn't attempt to bring something of its own to the table, mechanically speaking. Sure, the characters are somewhat original, as is the art style, but Angry Mob Games have based all of that around the gameplay mechanics of another series. A game like Horizon Zero Dawn, which borrows so many gameplay mechanics from other games still brought forth new and fresh ideas and in some ways reinvented those very inspirations. They took what worked and built something original around it. Brawlout doesn't. Had Brawlout took what worked in Smash Bros and built new ideas around the same formula, then maybe it would be something to pair alongside Nintendo's juggernaut franchise, but the moment that Nintendo does announce a new Smash Bros, Brawlout will be nothing more than a faded memory. brawlout WAS PURCHASED BY THE REVIEWER.